The Kiltedyaksman, who I collaborated with on a hireling generator for Classic D&D and who runs Red Box Niagara, posted a rant at his blog that generated a serious Dice Storm in the comments section. The rant was pretty much about having a major hate on for 4e D&D, especially what he sees as WotC co-opting current interest in older editions of D&D for it’s new Red Box. I was tempted to weigh in, because as much as I respect the Kilted One, I don’t agree with him. And as much as I can understand why people like 4e, 3e or whatever edition of the world’s most popular roleplaying game, there was a lot of misinformed opinions about the older editions being thrown around by defenders of modern D&D. There were also a lot of common prejudices about 4e being thrown around by defenders of older editions. And plenty of willful ignorance on both sides. But then it hit me–what’s interesting about the edition wars isn’t the wars themselves, it’s what it says about D&D. Old D&D is totally unbalanced and that’s great! So why is that? One reason is that for the most part, this game is a Cargo Cult. We learn by playing with a particular group of 2-8 people. And then we play with another group of 2-8 people. And then we do it again with another group. How many groups have you had? I’ve been playing for about 30 years, and I guess I’ve had 5-6 distinct groups: my first group, my teenage group, a group I played with after 3e came out, and my Vancouver group (including RBV). Throw in some con games and the occasional short campaign with other people, and my sample set for what D&D is doesn’t even break 10 groups. From now on, this is the only metric I’m going to judge editions of D&D: is it malleable enough that all those groups out there can play the game that they consider D&D? If not, we have a problem. If so, game on. Cue discussion of whether [some edition] meets those standards. Cue flame war. Cue cr0m deleting this blog post. His point was that the arguments about rules, editions, etc. exist because they’re the only way we have to talk about what goes on, but that when you listen to two different groups playing the same game they’re more diverse than the same group playing two different games. If you look at Dragon Magazine back when D&D was kind of a monoculture, this gets expressed different ways: what is alignment, what is a paladin allowed to do, are you using realistic-enough encumbrance or falling rules, etc. These also are mismatches between what one cargo cult holds sacred. I find that when I play different editions, or different RPGs, it clarifies my vision of what D&D is; looking at the Rorschach blot from different angles brings it into sharper focus. This isn’t cargo cult – I find it super useful to play with strangers, with other games, etc. – but it is solipsistic; I’m looking to better understand and express the thing I personally find compelling. I think a more useful metric is how hard is it for different groups to use an edition to play the thing they consider D&D, where malleability is both a measure of how flexible it is in stretching and how far it has to move from its core to reach them all. Note that in TSR D&D, a key element in this flexibility is ignoring all the rules that don’t support what you like, and houseruling to get the ones you do. I think WotC D&D loses flexibility by having an integrated complex design whose pieces interlock & are harder to ignore modularly, and also by encouraging transparency and expecting more rules-awareness among players so that there’s an increased feeling that you need to be doing it as written. 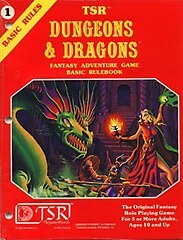 I think that, if some of the what made D&D was so popular was that the rules made no sense so you had to make your own, another part was the drive to centralize rules-knowledge in the referee that made Arneson & Wesely split from their old wargaming group and start the path that led to D&D. Tavisallison, your post has to be the most educated, well thought out, incitefull, enlightening and accurate response to the edition wars I’ve read in years. Does your edition of choice take you to another world and allow you to have fun and be creative? If so, it’s doing its job. Great post! Great site. If you would like to ignore all fantasy cliche and MMO bulshitt you can’t play with dnd. It isn’t depends on edition. All version have the own problem. If you want play a tabletop action game you would choose dnd. Brilliant post! I think this sums up the edition wars amazingly well. I’d never heard of cargo cults before but beautiful analogy.